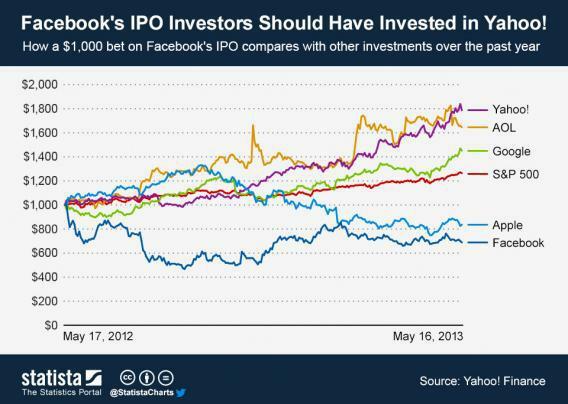 Facebook IPO anniversary: Hottest tech stocks of past year were Yahoo and AOL. This was supposed to be the year of Facebook. One year ago tomorrow, the social network went public, offering its shares for $38 apiece in one of the biggest tech IPOs ever. But the price began to slip almost immediately, and today it stands at just $26 a share, meaning that the company’s initial investors have lost a third of what they put in. What tech companies should they have invested in instead? Some of the biggest names of recent years, like Google and Amazon, have seen solid, steady growth in their share prices since Facebook went public. But as the German market-research portal Statista points out, there are at least two Internet giants whose stocks performed even better in the past year—and they probably aren’t the ones you’d expect. AOL, of all companies, has seen its stock soar from $26 a share in May 2012 to more than $37 today—almost the exact inverse of how Facebook’s shares have performed. Its fellow dinosaur Yahoo has done even better, leaping from around $15 last year to over $26 today. If you had the foresight (or orneriness) to buy shares in those two companies instead of Facebook a year ago, congratulations: You’ve earned the right to party like it’s 1999. In AOL’s case, CEO Tim Armstrong’s bid to reinvent the company as an ad-supported media business finally showed signs of progress in the past year. Meanwhile, the company somehow manages to keep raking in some half a billion dollars every year from dial-up subscribers, more than offsetting the losses in its other divisions. At Yahoo, new CEO Marissa Mayer has engineered what may be a more sustainable turnaround. She has succeeded in shaking up a moribund corporate culture by buying hot startups, bringing in star talent, and cracking down on employees who were using “I’m working from home” as an excuse to slack off. Her anti-telecommuting edict drew a lot of flak, but it seems to be working. Once in danger of becoming a punchline, Yahoo has returned to making headlines for bold moves rather than flagging revenues or leadership controversies. Today it’s in the news thanks to rumors that it might acquire Tumblr. Reporting on the talks, AllThingsD asked whether Yahoo will try to become “cool again” by acquiring the New York-based blogging platform, which is especially popular with teens and twentysomethings. That might be a stretch. It’s not like owning Hulu makes NBC, Fox, and Disney-ABC “cool again.” What it does is make them key players in an emerging new market that might otherwise threaten their existing businesses. Buying companies like Tumblr could do the same for Yahoo. Yahoo may never be cool again—was it ever cool in the first place?—but it has already achieved something better than that. It’s relevant again.